The quality requirements of the automotive industry for gears and transmissions are rising steadily. Compact designs and the trend toward higher-torque engines result in very high performance for manual, automatic, and differential transmissions. At the same time maximum running smoothness is required for driving comfort and the impression of quality of the vehicle as a whole. 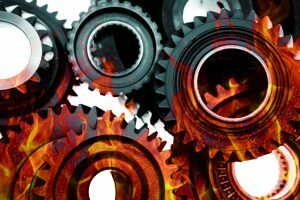 The stringent requirements for gear performance and running smoothness make it necessary to adapt gear geometry to the deformations that occur under load. This leads to ambitious geometries, with tolerance specifications in the micrometer range and stringent demands on the quality, structure, and strength of tooth flank surfaces. Extreme pressure on costs conflicts with these rising quality requirements, counteracted among other things by shortened production lines and throughput times. The important thing here is to use and combine the most high performance gear-cutting and finishing technologies to the best possible effect, on the one hand to increase productivity and cost efficiency and on the other to guarantee a stable production process at a high level of quality. The key production step in terms of quality is fine finishing of the hardened gears. The two gear-production processes most suitable for this are gear honing and threaded wheel grinding, which also deliver the economic viability for the mass market required by the automotive industry. 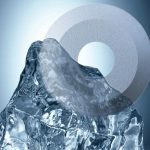 Gleason has introduced a range of innovations to increase the performance of both methods considerably. 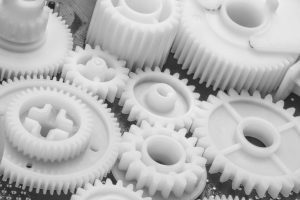 Gleason is the only supplier specializing in gear-manufacturing solutions with extensive expertise in all the technologies used in the industrial production of high-quality gears, for both soft cutting and hard finishing. The high quality of honed gears has previously required comparatively long machining times. 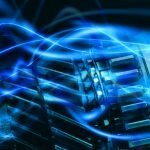 Over many years of research and development work, Gleason has increased the speed which can be achieved with honing from approximately vc = 3 m/sec to as high as vc = 15 m/sec. This not only improves the productivity of the method, but also extends its sphere of application. 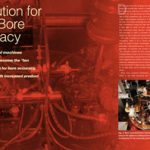 A fundamental requirement for the drastically increased performance of the process is an extremely rigid machine design. 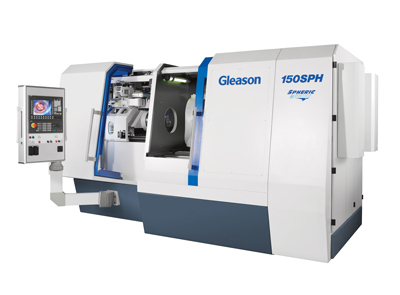 In the Gleason 150SPH Spheric® Honing Machine, the honing head which is mounted vertically on the concrete-filled machine bed passes the opposing forces directly to the machine bed, resulting in very rigid and low-vibration machine characteristics. With this design the machine reaches a tool speed of 3,000 rpm and workpiece speeds of up to 10,000 rpm. This results in a high removal rate, which makes honing economical even for stock allowances of up to 80 µm. Tool life, too, benefits from the extremely rigid machine design. 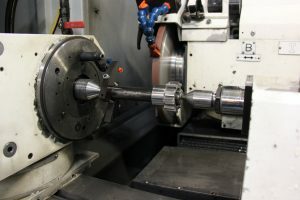 In conjunction with Spheric Power Honing (SPH) technology it is possible to produce many more gears with each tool compared to earlier designs. This is demonstrated by extended dressing intervals, which in turn lead to higher machine productivity. 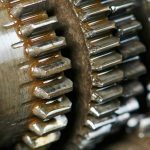 For typical vehicle transmission gears, the honing ring only needs dressing after approximately 600-800 workpiece cycles. 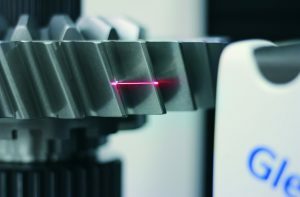 Specific computer-aided tracking of the cross axis angle between the tool and the workpiece when dressing also allows the honing ring to be profiled up to approximately 240 times, which in turn leads to extremely low tool costs per piece. 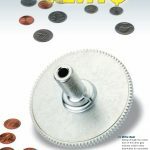 Overall, machines of the SPH series can be used to cut cycle times in half compared to conventional honing applications and tool costs per piece drop to an exceptionally low level—below € 0.04 for gears for typical car transmissions—without an additional fine finishing operation such as shaving or grinding. 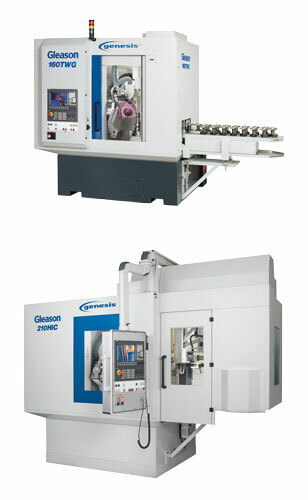 In addition, the Gleason 150SPH is equipped with a fast workpiece changer to minimize nonproductive time. Gear blanks are clamped using a standard hollow taper shank (HSK) workholding in parallel with machining. Process-specific twist naturally occurs in all gear grinding methods and this leads to deviations from specified tooth geometry. These deviations do not facilitate optimum generation and noise characteristics, which is why twist compensation makes sense. The twist compensation methods used to date, however, are complex, costly, and have not become practical in application. As a consequence, Gleason has been extensively involved in twist effects from a very early stage and has built a systematic understanding of the deeper technical contexts. Gleason has developed and patented a method to minimize and compensate for all twist effects. It is even possible to use the new process for specific desired twist effects in a defined quality to promote optimum engagement of the tooth flanks. Gleason has furthermore developed a process with a favorable impact on the surface texture generated during threaded wheel grinding, which has benefits with regard to gear strength and noise characteristics. 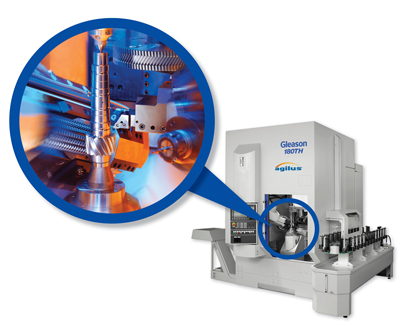 These innovations have been implemented and proven in the Gleason Genesis® 160 TWG Threaded Wheel Grinding Machine, making it one of the most productive and versatile machines for hard finishing gears. The load-carrying capability and the noise of a gear are determined by the quality of hard machining. Process reliability and the productivity of hard machining, however, are directly dependent on the quality of soft machining. 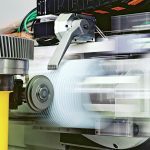 To increase the efficient use of resources, the trend in soft machining of gears is toward the integration of several process steps in one machine, e.g. hobbing, chamfering, and deburring. A completely burr-free tooth slot and a precisely defined chamfer are fundamental prerequisites for the subsequent hard machining process. Chamfering/deburring is much simplified by integration in the hobbing machine. One re-clamping step is saved and the tooth position, which is known exactly from the hobbing operation, can be used directly for chamfering without repeat centering. The space required to set up a separate deburring machine and its peripherals is saved and parts logistics are simplified. This solution has been implemented in the Gleason Genesis 210 HiC Hobbing Machine. 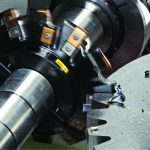 With the Agilus series the tool turret of the machine provides all the fixed and rotating tools required for complete machining. It can furthermore be equipped with workpiece-specific grippers for workpiece change. 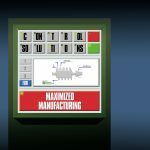 This allows the machine to be integrated very simply in a variety of automated production facilities. A quick-change tool system reduces setup times and reduces the amount of workholding equipment. 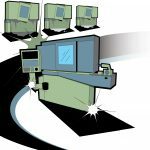 Integrating all soft machining process steps in a single machine saves considerable space, setup, and retooling complexity and nonproductive time compared to a line made up of several standalone stations. 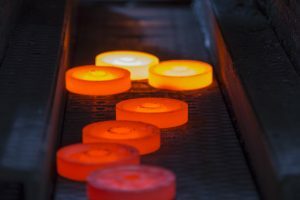 Total investment costs are less and technical synergies that cannot be found in a conventional production line are now possible. For example, the sequence of machining steps can now be arranged so that in addition to the reclamping and transport tasks saved, several process steps from the conventional sequence at once become redundant. On the Agilus machines the first machining step after the workpiece is automatically clamped is turning in a roughing cut, drilling, then immediately followed by hobbing. 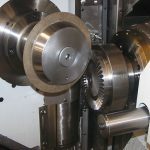 The subsequent finish turning of the remaining diameter can be performed, followed by the coarse deburring of the gear. 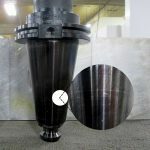 Separate machines and tools for these process steps, as well as the vast majority of machining and nonproductive time usually required, can be saved without any forfeit in quality. 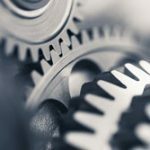 By concentrating various technologies in a production cell, the customer now benefits from gear production from a Total Solutions Provider who masters all the key technologies of gear-production equally and can combine them to provide an efficient overall solution to support an investor’s individual operating, economic, and strategic objectives to the best possible extent. 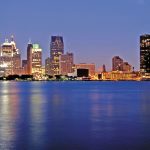 is director of product management: shaving, honing, chamfering, and deburring for Gleason Corporation. In the past, he has held positions such as: development engineer for Hurth Company, Munich; head of the Tooling Business Unit, Gleason-Hurth; and member of the general management Gleason-Hurth. He has studied at the University for Applied Sciences at Aalen and the Technical University of Munich. 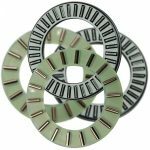 has held a number of positions in the machine tool and gearing industries, most recently as director of product management for hobbing and shaving solutions at Gleason Corporation. He has authored a number of papers on gear processing and technology. 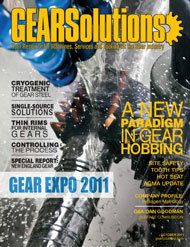 To learn more about Gleason’s products and services, visit them online at www.gleason.com.